Commonwealth War Graves Commission and Victoria Cross and George Cross Association to receive funding from banking fines. George Osborne has pledged £1.8 million towards remembering Britain’s war heroes, during a visit to Manchester to attend the Battle of the Somme Centenary. The Chancellor confirmed the Commonwealth War Graves Commission (CWGC) will receive £1.3 million to build a visitor centre near Arras in Northern France, close to the site of several First World War battlefields. The centre will allow visitors to learn about the battlefields, get support in planning their visits and see the CWGC’s skilled craftsmen at work maintaining Britain’s military cemeteries. The funding announced today will also allow the CWGC to train student guides to lead tours of the Somme and Ypres battlefields. 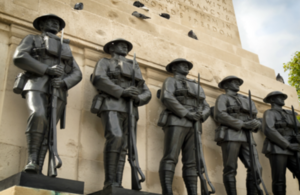 This follows a hugely successful Canadian scheme, and would ensure visitors get a full understanding of the sacrifices made by British soldiers for their country and also engage younger generations with the War. The students will also help ensure the huge wealth of stories from First World War battles are available online for relatives and the public. A further £500,000 is being committed by the government to the Victoria and George Cross Association to help them ensure that graves and memorials of medal recipients worldwide are restored and kept in good condition. The Association records the sites of graves worldwide of Victoria Cross and George Cross recipients – wherever they are buried, whether they fell in battle or died later in life. The Battle of the Somme saw many examples of incredible bravery and 9 Victoria Crosses were awarded on the first day of fighting alone, with 51 issued in total from the battle. The funding for both schemes comes from banking fines levied on the industry, and is part of more than £500 million pledged by the Chancellor to support military and emergency service charities and other good causes since 2012. The CWGC is a Royal Charter body established during the First World War to provide permanent graves and memorials to the fallen of the Imperial forces. It marks its centenary in 2017. The Victoria Cross and George Cross Association represents all holders of the UK’s two highest awards for gallantry. It also supports the widows of deceased holders. So many millions of people in Britain today have a family connection to those who ‎fought and died on our behalf 100 years ago. I’m so proud of my grandfather and namesake, George Osborne, who fought and was wounded on the Western Front and survived, and his brother, my great uncle Derrick Osborne, who was killed in 1918. The Battle of the Somme centenary in Manchester is a fitting and moving commemoration of the sacrifice made by British and Commonwealth solders for their country in the First World War. It is more important than ever to remember the bravery and loyalty of our armed services in defending our country and its values. That is why I have announced nearly £2 million funding today to ensure future generations understand what happened during the First World War and also that the graves of British heroes worldwide who displayed the highest valour in subsequent armed conflicts are looked after. It’s right that funding from those in the banking industry who demonstrated the worst of British values goes towards remembering those who displayed the very best of British values. The CWGC is delighted to receive this funding and we are very grateful to the Chancellor for his initiative. This money will enable us to do two things: firstly, to introduce a guide programme at the Somme and Ypres, based on the Thiepval and Menin Gate memorials to the missing. Based on a Canadian model, this will aim to recruit young people of student age as guides. Coming on the centenary of the Somme, this will help us to harness the increasing level of awareness in the British public for what their grandfathers and great grandfathers sacrificed a hundred years ago. Secondly, the CWGC will use some of this funding to explore options for developing a CWGC visitors’ centre on the Western Front. The members of the Victoria Cross and George Cross Association were really delighted to hear of this award and are very grateful for it. Since 2003, through the Association, the living holders of the two awards have supported the restoration of the graves of Victoria Cross and George Cross recipients and the creation and restoration of memorials in honour of the valour and sacrifice of those who have served their country and fellow man. Over the years, they have supported the restoration and or creation of approximately 65 graves and memorials, as well as given advice and established links between interested parties to enable the funding of and work on many others. They are now very excited that the future of their work and their involvement is assured thanks to the level of this award.